Each of the three substantive items uses a standard FMX action, and to be honest, I have always found them poorly coded since they were introduced in XE3. However, the menu bar not being built correctly at all didn’t happen in XE3. Comparing the FMX Mac menu bar source code between XE3 and XE5 doesn’t come up with much though – the code for building the default menu bar has been split out into its own method, and that’s about it. However, after adding a couple of breakpoints and running the ActionsDemo sample through the debugger, I discovered the key method – TPlatformCocoa.CreateOSMenu – being called several times when the application was starting up. Partly this was due to style notifications, and partly due to the code being re-entrant in a somewhat sloppy way – TPlatformCocoa.CreateOSMenu first gets rid of what was there before, however the clean-up code for a FMX menu item on OS X religiously calls CreateOSMenu to rebuild the menubar regardless of whether the item is being destroyed singularly, or as part of a general ‘get rid of everything’ call. Since the CreateOSMenu code in itself doesn’t take account of possible re-entrancy (i.e., being called again when it hasn’t yet finished the time before)… the end result is not well determined. Save the unit, add it to the project, and rebuild. Bring up the form’s designer surface, right click on it and select View as Text. 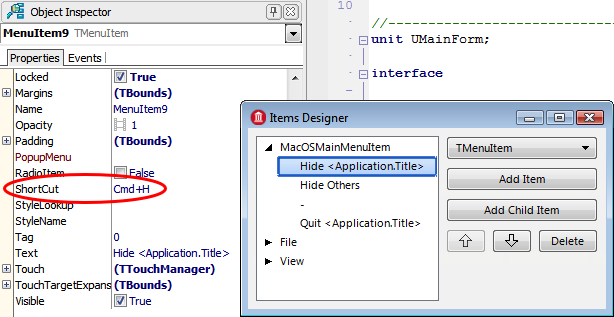 Find TFileHideApp and TFileHideAppOthers at the end, and change the types to plain TAction. Right click and choose View as Form. Double click the action list, and in the action list editor, find and put back the two actions’ standard Text and ShortCut properties – the Text for FileHideApp1 should be ‘Hide ActionsDemo’ and the ShortCut Cmd+H; the Text for FileHideAppOthers1 should be ‘Hide Others’ and the ShortCut Cmd+Alt+H. PS (and changing the subject) – for those who contacted me a bit ago about my Exif code, sorry, I will get round to replying, but I’ve just been busy with other things recently. Browsing StackOverflow, I came across a question asking how to programmatically shut down the computer in Delphi when targeting OS X. Mysteriously, the question has been met with four downvotes as I write this, leaving it ‘on hold as off-topic’ until the darstardly questioner stops thinking a programmer’s Q&A site is a proper place for programming questions or something. As desired, ‘to shut down’ can be replaced with ‘to restart’, ‘to sleep’ or ‘to log out’. The problem here is that NSWindowZoomButton is not a valid member of a Cocoa window style ‘set’, a fact the compiler wasn’t able to pick up given Objective-C does not have strongly typed sets like Pascal. Further, you cannot in fact hide or disable the zoom button via the window style – instead, you get a reference to the actual button and hide or disable it ‘directly’. Setting the ‘target’ to nil is necessary, otherwise the Enabled property will get automatically re-enabled – roughly, you can think of the button as having had an action assigned to it when created, and setting the Target to nil as like setting the Action property to nil again.